Last night I watched the Sport Relief Million Pound Bike Ride. At first, I thought that the celebrities taking part had ridden the full distance from John O' Groats to Lands End. Obviously, they didn't. They all completed the first 12 miles and then took it in turns to complete 26 miles (2 hours). In 82 hours, the seven celebs cycled the length of the UK, day and night, scaling 1,000ft peaks, battling icy blizzards and lows of -15 centigrade. 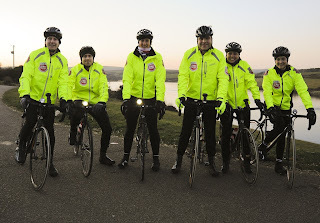 It's quite an amazing achievement that 7 non-cyclists completed almost 1,000 miles between them. They must have had to do about 40 miles each, per day. Another amazing achievement is that they actually raised the £1m that they'd hoped to raise. However that's no reason to stop giving them money. If you'd like to donate to Sport Relief, Text BIKE to 70005 (texts cost £5) or visit the Sport Relief website.